Designed with a 4 1/2” (114mm) wide roller, this Cable Block is perfect for temporarily supporting Multi-Port Terminal fiber on 1/4 - 3/8 in. (6-10mm) dia. suspension strand during new construction or while over lashing to existing lashed cable. 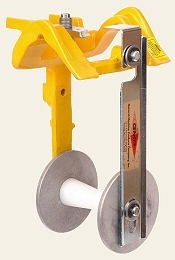 This VATS Guide (PN 70374) is designed to be used as either an in-feed guide, utilizing the Strand Bracket (PN 70373), or as a corner guide when attached to the Pole Bracket (PN 70372). With a 4 1/2” (114mm) wide opening, it’s your first choice for placing the new Multi-Port Terminal Fiber.